Few British-period works of military architecture manage to exert such a commanding presence, as well as a sense of solidity and domineering invincibility, as Fort Mosta (or Musta as it was officially referred to by the British military). Occupying a central position along the escarpment of the Great Fault, Fort Mosta (Naxxar , Malta) was the most strategically-placed land fort on the system of inland defenses known collectively as the Victoria Lines. The Fort’s designation as a ‘land fort’, its strategic location roughly in the center of the North-West front (later renamed the Victoria Lines), and the topography of the site on which it was built, were all to dictate both its structural shape and form and its defensive role (and, hence the nature of its armaments with which it was to be equipped). Fort Mosta was originally designed as one of three isolated strongholds on the North-West Front. This was a defensive position adopted by the British military and intended to divide Malta into two parts, concentrating the fortified assets along the line of a natural fault cutting across the width of the island. The fort occupied the cliff face on the spur of land at the mouth of Wied il-Ghasel and was apparently built (according to available documentation and some archaeological evidence) on the site of a Bronze Age citadel and village. Like most of the forts of this period, late in the history of fortification, the design of Fort Mosta was tailored around its perceived role, and the armament considered suitable for the task. Initially, this was to consist of seven 64-pdr smooth-bore muzzle loading guns mounted inside protective vaulted casemates. Seven other guns proposed to be installed on disappearing carriages were, however, never mounted. Like most of the first-generation British forts of the 1870s, Fort Mosta was constructed from a hybrid combination of masonry, hewn rock, earth, and cast-in-place mass concrete elements. Undeniable, the most structurally imposing and defining feature of Fort Mosta is its keep. Considering its comparatively large size and its many casemated gun emplacements, the keep at Fort Mosta can easily pass off as a veritable fortress in its own right. 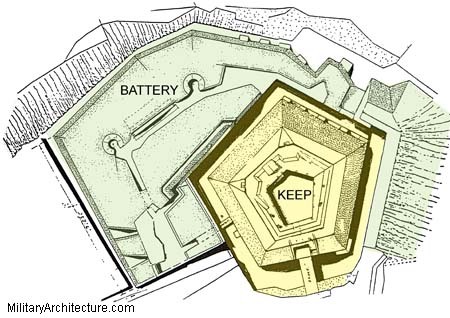 The structure was actually the original fort and only became a ‘keep’ at a later stage in the design process when the outer detached ward, or battery, was thought necessary and grafted onto the position to give it its present shape. 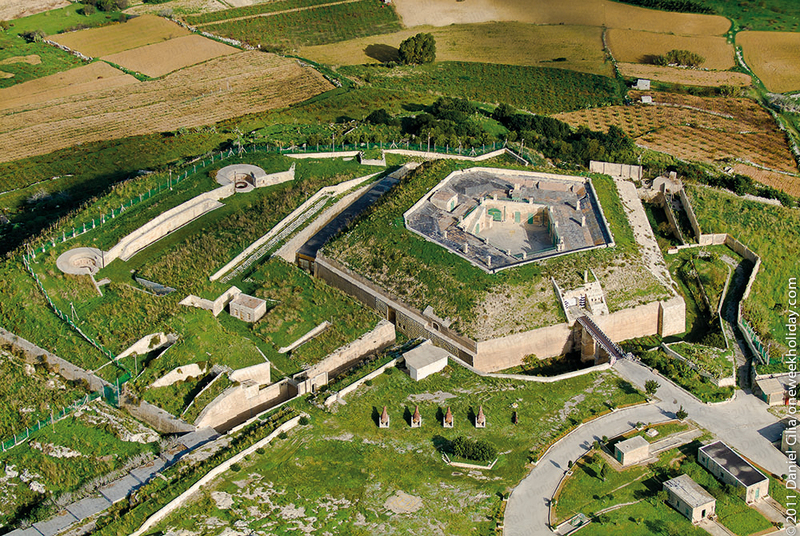 The main defensive elements of the Fort Mosta keep were its enveloping ditch, which isolated the keep from the outer enceinte and also from the mainland to the rear, and three counterscarp musketry galleries which provided the necessary enfilading fire, and were linked to the keep by means of an underground tunnel. Entrance into the keep was through a main gateway situated in the middle of the south face and this led directly into a spacious central courtyard. The gate was served by a Guthrie rolling drawbridge, which hasn’t survived, and was flanked by a small defensive musketry position containing three loopholes. With the abandonment of the Victoria Lines as an inland defensive position during the early years of the 20th century, Fort Mosta lost most of its military value, unlike the other two forts on the Victoria Lines, which were retained in use in a coastal defense role. By 1940, the fort was being used simply as a munitions depot, a role which it has continued to fulfill to the present day.